Potholes: How can I fix them? Potholes are quite a contentious issue right now, with more and more appearing on our roads and pavements every day. Whether it’s down to poor road maintenance, extreme weather or poor repair treatments, it’s important to figure out the best way to tackle them and hopefully stop them from re-appearing in the same place any time soon. In light of this, we’re taking a look at the pros and cons of pothole repair solutions /methods to see which one comes out on top ensuring your site is not left with dangerous potholes like the one in the image above. You may be surprised at how many people identify a pothole on their premises, street or walkway and decide to do nothing in the hope that it will miraculously go away - it definitely won’t. 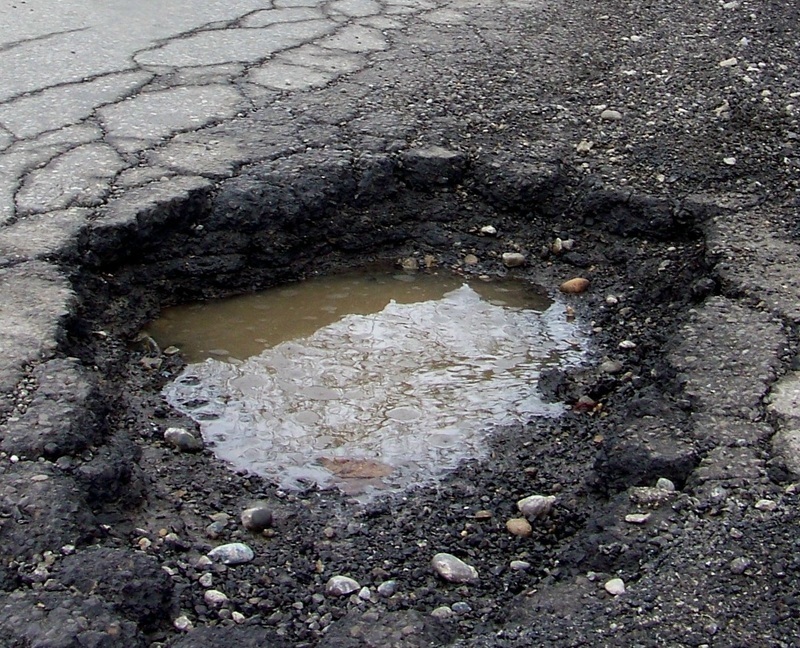 An untreated pothole is not only a danger to pedestrians and can cause damage to passing cars, but also it is only going to get worse. What starts out as a small fracture on the surface, will get deeper and bigger if left alone, due to the fact it’s more exposed to the elements. This in turn will cost you more in repairs in the long term, as a smaller pothole is much easier and cheaper to repair. If you have spotted a pothole, you may look to do a temporary repair, which can be a cost effective and quick pothole fix as it will cause less disruption in areas with heavy traffic, and is better suited to repairing potholes during poor weather conditions as it uses a cold material to fill the hole. However, the problem is that temporary repairs are exactly that, temporary. Thus you will eventually have to apply another temporary repair or look for a permanent repair solution, which will inevitably end up costing you more time and money. The conventional permanent repair for potholes involves cutting a rectangular or square area around the pothole (called a cold joint) that gives a clean, straight surface for the repair material to adhere to. Before applying the hot bitumen (asphalt), the hole is also cleared of any loose debris and coated with a bituminous sealant. 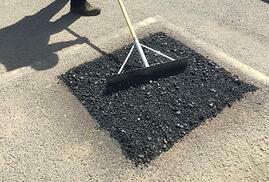 This ensures the hot bitumen solution takes the surface properly, once it has been compacted down to level it out. This type of solution is understandably much more time consuming and but also far more effective than a temporary repair, however can have much larger cost implications as it requires more manpower, equipment and expertise. Plus, it doesn’t always solve the problem of potholes in a specific area and can still mean a complete resurfacing job. The cold joint in between the existing and new surfaces is a point of weakness, any water penetrating into the joint will result in failure and ultimately another pothole. Another option for pothole repair is to use infrared technology, which fuses the old surface with the new far more effectively than the permanent or temporary repair methods. This will mean that pothole repairs are much more effective, as you are left with no cold joints like the conventional repair, making the surface more durable and robust. In addition this durability means it can be a very cost effective pothole repair solution too, as fewer repairs will be needed in the future. Infrared repair is also the most environmentally friendly and long lasting of all methods as it utilises the existing material leaving very little waste as a result. It’s pretty clear to see that temporary repairs – although quick – are not sustainable, so isn’t it time a cost effective, robust fix was the go-to method?